America has not had a Formula One World Champion since Mario Andretti won the whole thing for Lotus in 1978. In fact, many argue that a competent Formula One driver hasn't come out of America since Mario Andretti. But now there are a few talented Americans making waves in Europe on the road to Formula One. 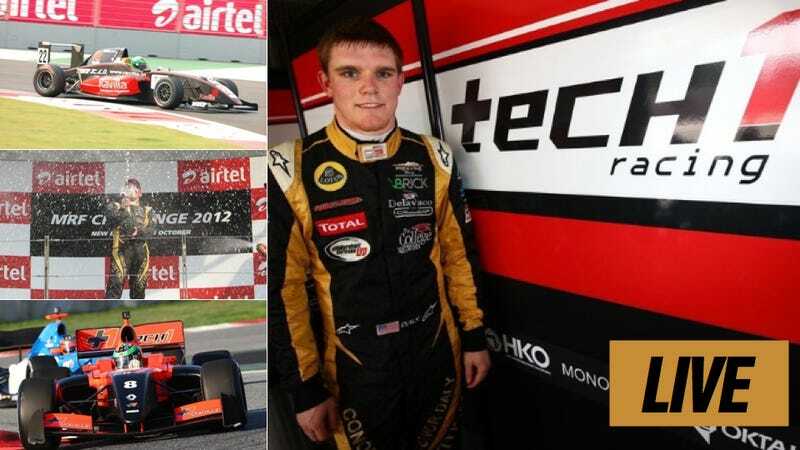 One of the closest to a seat in F1 is 21-year old Conor Daly. And he's here right now to answer any and all of your questions. Fire away! Conor comes from a racing family; His father Derek Daly raced in Formula One, Champ Car, and at Le Mans. He is also a well known presence on American IndyCar and F1 broadcasts. That's why it's kind of surprising that Conor started racing go karts at the ripe age of 10 years old. That seems young, but it actually is kind of old these days. Tons of kids start racing aged four. Since that time, Conor has gone on to compete and win at every level he has raced, including Star Mazda, Indy Lights, and, most recently, the GP3 championship. He also had one hell of a scary crash at the Monaco round that he was lucky to walk away from. He has tested a Force India Formula One car and just last week tested a Foyt Racing IndyCar. Apparently he was very, very quick. Why aren't we surprised? As for next year, plans are currently up in the air, but Conor has said that the end goal is to get to Formula One. That means the next step is a ride in GP2 or a similar feeder series. But for now, Conor is here for the next hour. Ask him anything you want about racing, driving an F1 car, his competitors, how hard it is to get sponsorship, plans for next year, and anything else you want to know. Let's gooooo! UPDATE: Conor had to run, but thanks for asking all the questions! Let's hope we see him in F1 in the near future.